My Chris Young album review has been quoted on his official website. My Chris Young album review for American Songwriter has been quoted on CY’s official website. My review of David Cook’s latest album, This Loud Morning has been featured on David Cook’s website. Luke Laird is not merely another MTSU alum success story; he has become one of Nashville’s most prolific songwriters. Laird has already racked up six No. 1 hits, including Carrie Underwood’s “So Small,” Blake Shelton’s “Hillbilly Bone,” as well as Sara Evans’ recent No. 1 song, “A Little Bit Stronger,” which Laird co-wrote with Hillary Lindsey and Lady Antebellum’s Hillary Scott. Laird has also written songs for some of Music City’s top artists, including Kenny Chesney, Rascal Flatts, Tim McGraw, Lee Ann Womack, JoDee Messina, Trace Adkins, Little Big Town, Clay Walker and Amy Grant. In just nine years, Laird’s songwriting career has flourished so quickly, Warner/Chappell Music Senior Director of A&R BJ Hill has coined the phrase “Luke Laird-ing,” when referring to a songwriter’s ability to crank out hit songs down on Music Row. Recently, The Murfreesboro Pulse was granted an opportunity to discuss Laird’s impressive career achievements. The Middle Tennessee State University graduate offered some interesting insight into his private world of hit songwriting. 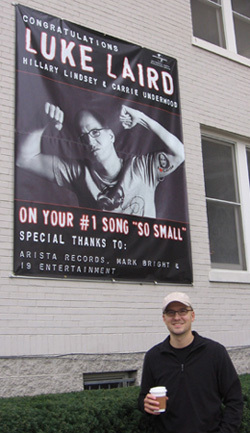 Murfreesboro Pulse: How long have you been writing for Universal Music Publishing? Luke Laird: I originally started writing for BMG in 2002, and then Universal bought them so it’s been almost nine years. MP: How did you end up at MTSU from Conneaut Lake, Pennsylvania? LL: I knew I wanted to be in Nashville for music and writing songs and my mom had heard about MTSU’s program from a friend. So we visited it the summer between my sophomore and junior year in high school. I liked it and it was the only college I applied to. I graduated from MTSU in December 2001 with a degree in Recording Industry Management. MP: At what age did you start writing songs? LL: I started writing songs as far back as first grade. It just kind of came natural to me when I started playing guitar, especially around third grade. MP: Who were some of your favorite artists while you were growing up? LL: I listened to a lot of Top 40, and then when I was in junior high, the whole Garth Brooks thing exploded, and I got into country music. My first concert was Randy Travis. Then on my first trip to Nashville, I went to the Bluebird Café and discovered the whole songwriting scene and that really appealed to me. MP: After graduating from college, it took two years of playing your songs for Chris Oglesby at BMG Music Publishing. What was that time period like for you, being on the edge of success? LL: I felt encouraged because he was the first guy who really showed an interest in my songs. But at that point, I felt like I was on the right track, and I continued to write every day to try and get better. MP: Do you remember where you were the first time you heard one of your songs on the radio? LL: Yes, I was in the car on the way to a writing session when I heard “So Small” by Carrie Underwood. That was my first No. 1 single and that was very cool. MP: Let’s discuss your writing process. Does the music or do the lyrics come first for you? LL: You know it varies. A lot of the times, the music does come first for me. The initial spark will come from a melody while I’m sitting here with my guitar. Every now and then, I’ll write down the idea whether it’s just a title or a concept then I’ll try to decide what kind of feeling I want that to evoke to go with the music. Also, when I collaborate with other songwriters, they will have often have some great ideas too. MP: Do you have a specific time set aside for writing? LL: For the most part, I write Monday through Friday. I usually get to my office anywhere from 10 to 11 a.m. Sometimes I’ll get there earlier, but I usually put in a full day at least five days a week. MP: Where does your inspiration for writing come from? LL: I guess it often comes from life in general. I’m also influenced by different kinds of music, because I’m always buying lots of new albums, so I’m sure some of that creeps in there. I’m just trying to connect with everyday people, especially when writing country songs. I spend time thinking about how and where I grew up, so I’m influenced by all of those things. MP: How do you pitch your songs? LL: Sometimes I record demos that start out with a just scratch vocal while playing everything myself in my own studio, while other times I’ll book a full tracking session and hire some of the great Nashville musicians and record that way before turning them into my publisher. I pitch my own songs a little bit, but I’d rather someone else do that. I prefer to write songs instead of pitching them. MP: How do you feel when first hearing the metamorphosis of your songs from demo to fully produced end result? LL: You can’t really describe it. It’s a really great feeling, and it re-inspires me every time to hear something start from nothing to something. It’s cool and makes me want to keep doing it. Sometimes, it turns out sounding a lot like the demo, and other times, it’s a complete surprise. That’s why I try to make my demos sound as good as I can. MP: Do you prefer to write alone or co-write? LL: I actually enjoy both, but I mostly co-write since I’ve gotten my publishing deal, because some of my best friends are writers or co-writers. Writing alone takes a lot more discipline and it can be a longer process, but I feel like it’s still good to do because writing by myself makes me a better co-writer. MP: Did you originally have aspirations to be an artist or did you always see yourself as a songwriter? LL: When I was younger, I definitely entertained the idea, but I realized early on that being an artist was never really a passion of mine. To be an artist you have to really want to do it and be willing to sacrifice a lot. I enjoy playing a songwriter’s night now and then, but I enjoy the creative side so much more. It takes a special kind of person to pursue a career as an artist, and that was never really my goal. MP: Do you ever fear your success might suddenly come to an end? LL: It’s taking a while to achieve this amount of success, and I’m fully aware that it could be here one day and gone the next. I don’t have a lot of fear about that honestly. I feel as long as I continue to work hard, I can be successful and everything will take care of itself. MP: Have you ever dealt with writer’s block? LL: I have days where I’m uninspired and nothing much happens, but I think the best way to get through those times is just to keep writing and work through it until I come up with something. When writing is your job, it’s important to have a good work ethic, at least that’s been my experience. MP: What do you think you would be doing if songwriting wouldn’t have worked out? LL: Ha! That’s a great question. I’d probably be trying to work in some area of the music business. I actually worked as an assistant tour manager for Brooks & Dunn before I got my publishing deal. So I may have tried to go into management, but I think it all works out if you find what you’re good at and try to excel at it. MP: Your songwriting résumé reads like a who’s who of country music. Is there one artist in particular you still want to cut one of your songs? LL: At this point I can’t think of any one artist that I feel would really make my career. I’m just thankful for any artist that has or would want to cut one of my songs. MP: Do you have any advice for aspiring songwriters? LL: I think it’s important for anyone who wants to become a songwriter to remember that no matter how many connections they make by networking, or who they get to know, at the end of the day they still have to be able to deliver a great song.